Liz joined MultiState as a Senior Policy Analyst and Economist in 2015, and now serves as Director, Strategic Government Relations and Economist, advising clients on policy and advocacy strategy and helping to lead the firm's Strategic Government Relations team. Prior to MultiState, Liz served as an Economist in the Tax Foundation's Center for State Tax Policy, where she managed the Foundation's state chart book program, provided ongoing state tax policy and economic analysis, and presented to state lawmakers and tax stakeholders around the country on pertinent state tax issues. 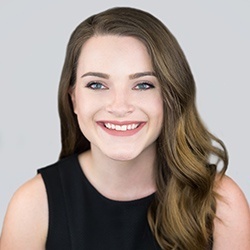 Liz started her career in tax policy and government relations working as a research intern at the Wyoming Taxpayers Association, and holds a Master of Arts in Economics from Duke University, a B.S. in Economics from the University of Wyoming (UW), and a B.A. in History, also from UW.